Redside shiners are small baitfish that have a pink stripe down their side. They are a favorite snack of large trout such as Cutthroats and Tiger Trout. Redside shiners are a nongame species of fish, and therefore the taking of them is not regulated. You can keep as many as you like. They make excellent bait for catfish, cutthroat trout, walleye, pike, and many other predator fish. 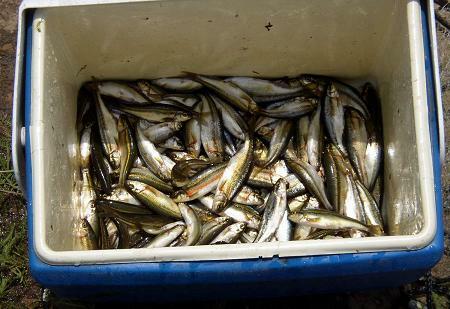 It shouldn't be too hard to catch shiners in waters where they are present in significant numbers. They are typically caught using a casting net or a minnow trap.